Compliments of Italy, this rhubarb-gelato is comparable to rhubarb-ice-milk. Similar to ice-milk, but not an ice cream, this gelato with rhubarb is a nice light semi-frozen dessert. Gelato originates from Northern Italy. Gelato is from the word "gelare" which means "to freeze." It is similar to ice cream but in fact it is not classified this way at all. Gelato does not contain the percentage of butterfat required to be in the same category. Cream is not found in a true gelato. Traditionally, eggs are part of the gelato recipe along with milk and sugar. A variety of flavors are used in these recipes such as spices, chocolate, liquor and fruits just to name a few. The popular fruits include lemons and strawberries. A popular combination of vanilla and chocolate is made frequently. A rhubarb-gelato will melt very quickly because in true form, it should be semi-frozen when served, and because it is so dense. Much softer than ice cream, a gelato can be molded and swirled very easily. Gelato is actually quite silky in texture. Depending upon the ingredients used, the fat and calorie content of a gelato will be more or less than in other recipes. 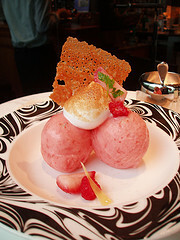 Try a rhubarb-gelato if you are looking for a different texture, or an alternative to a heavy frozen dessert. Bring to a low boil over medium heat, and stir until rhubarb is very tender.Let cool and puree in a processor until smooth. Strain the puree and set aside. Heat but do not let boil. Keep heating to dissolve gelatin and sugar. Strain this mixture into a large bowl and pour in the pureed fruit mixture. Spread in a suitable freezer container and place in the freezer. Partially thaw before serving. Many people now use ice cream machines or gelato making machines. But, if you don't have either, that's ok.
Do your final mixing in a stainless steel bowl, and sit the bowl in an ice bath to chill or simply place it straight into the freezer. After an hour or so, take it out and give it a good stir. Place the bowl back in the freezer. Do this a number of times throughout the freezing process. This ensures that the gelato will have a creamy and smooth texture. Mix all ingredients and cook over low heat. Stir constantly as sugar dissolves. Do not bring to a boil. Refrigerate until well chilled. Put into a suitable freezer container and place in the freezer. Serve semi-frozen. For a different flavor, exchange the strawberries for raspberries. If you love ice-cream-like desserts like I do, visit these additional recipes using rhubarb. Learn to make your own ice-cream as well.